"Ave Maria" redirects here. For other uses, see Ave Maria (disambiguation). For other uses, see Hail Mary pass and Hail Mary (disambiguation). The Hail Mary, also commonly called the Ave Maria (Latin) or Angelic Salutation, is a traditional Catholic prayer asking for the intercession of the Blessed Virgin Mary, the mother of Jesus. 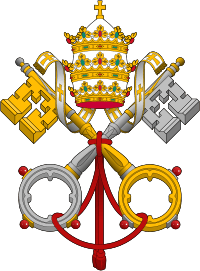 In Roman Catholicism, the prayer forms the basis of the Rosary and the Angelus prayers. In the Eastern Orthodox and Eastern Catholic Churches, a similar prayer is used in formal liturgies, both in Greek and in translations. It is also used by many other groups within the Catholic tradition of Christianity including Anglicans, Independent Catholics, and Old Catholics. Some Protestant denominations, such as Lutherans, also make use of a form of the prayer. 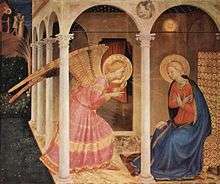 Based on the greeting of the archangel Gabriel to the Virgin Mary in the Gospel of Luke, the prayer takes different forms in various traditions. It has often been set to music, although the most famous musical expression of the words Ave Maria — that by Franz Schubert — does not actually contain the Hail Mary prayer. The prayer incorporates two passages from Saint Luke's Gospel: "Hail, full of grace, the Lord is with thee," and "Blessed art thou amongst women and blessed is the fruit of thy womb." In mid-13th-century Western Europe the prayer consisted only of these words with the single addition of the name "Mary" after the word "Hail," as is evident from the commentary of Saint Thomas Aquinas on the prayer. The first of the two passages from Saint Luke's Gospel is the greeting of the Angel Gabriel to Mary, originally written in Koine Greek. The opening word of greeting, χαῖρε, chaíre, here translated "Hail," literally has the meaning "rejoice" or "be glad." This was the normal greeting in the language in which Saint Luke's Gospel is written and continues to be used in the same sense in Modern Greek. Accordingly, both "Hail" and "Rejoice" are valid English translations of the word ("Hail" reflecting the Latin translation, and "Rejoice" reflecting the original Greek). The word κεχαριτωμένη, (kecharitōménē), here translated as "full of grace," admits of various translations. Grammatically, the word is the feminine present perfect passive voice participle of the verb χαριτόω, charitóō, which means "to show, or bestow with, grace" and, in the passive voice, "to have grace shown, or bestowed upon, one.". The text also appears in the account of the annunciation contained in the apocryphal Infancy Gospel of Matthew, in chapter 9. The second passage is taken from Elizabeth's greeting to Mary in Luke 1:42, "Blessed art thou among women, and blessed is the fruit of thy womb". Taken together, these two passages are the two times Mary is greeted in Chapter 1 of Luke. Θεοτόκε Παρθένε, χαῖρε, κεχαριτωμένη Μαρία, ὁ Κύριος μετὰ σοῦ. εὐλογημένη σὺ ἐν γυναιξί, καὶ εὐλογημένος ὁ καρπὸς τῆς κοιλίας σου, ὅτι Σωτῆρα ἔτεκες τῶν ψυχῶν ἡμῶν. God-bearing Maid, rejoice, grace-filled Mary, the Lord with thee. Praised thou among women, and praised the fruit of thy womb, because it was the Saviour of our souls that thou barest. To the Biblical texts this adds the opening invocation "Theotokos Virgin," the name "Mary" and the concluding "because it was the Saviour of our souls that thou barest." After considering the use of similar words in Syriac, Greek and Latin in the 6th century, Herbert Thurston, writing in the Catholic Encyclopedia concludes that "there is little or no trace of the Hail Mary as an accepted devotional formula before about 1050," (though a later pious tale attributed to Ildephonsus of Toledo (fl. 7th century) the use of the first part, namely the angel's greeting Mary, without that of Elizabeth, as a prayer). All the evidence suggests that it took its rise from certain versicles and responsories occurring in the Little Office or Cursus of the Blessed Virgin which just at that time was coming into favour among the monastic orders. 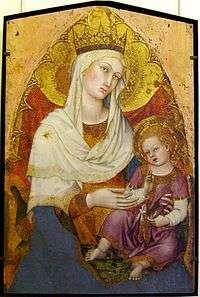 Saint Thomas Aquinas spoke of the name "Mary," which served to indicate who was the "full of grace" person mentioned, as the only word added at his time to the Biblical text. But at about the same time the name "Jesus" was also added, to specify who was meant by the phrase "the fruit of thy womb." The Western version of the prayer is thus not derived from the Greek version: even the earliest Western forms have no trace of the Greek version's phrases: "Mother of God and Virgin" and "for thou hast given birth to the Saviour of our souls." Eleven years later, the sentence was included in the Catechism of the Council of Trent of 1566. The "Catechism of the Council of Trent" says that to the first part of the Hail Mary, by which "we render to God the highest praise and return Him most gracious thanks, because He has bestowed all His heavenly gifts on the most holy Virgin ... the Church of God has wisely added prayers and an invocation addressed to the most holy Mother of God ... we should earnestly implore her help and assistance; for that she possesses exalted merits with God, and that she is most desirous to assist us by her prayers, no one can doubt without impiety and wickedness." et benedíctus frúctus véntris túi, Iésus. In the Eastern Orthodox and Byzantine Rite Eastern Catholic churches, the prayer is very common in the Greek form indicated above, or in translations from it. Although it is not said quite as often as in the West, it is well known and often used and appears in several canons of prayer. It is typically sung thrice at the end of Vespers during an All-Night Vigil, as well as occurring many times in the course of daily prayer. якѡ Спаса родила еси дѹшъ нашихъ. The first is the older, and remains in use by the Old Believers as well as those who follow the Ruthenian recension (among them the Ukrainian Greek-Catholic Church and the Ruthenian Catholic Church). The second, corresponding more closely to the Greek, appeared in 1656 under the liturgical reforms of Patriarch Nikon of Moscow, and is in use by the Russian Orthodox Church, the Serbian Orthodox Church, the Bulgarian Orthodox Church and the Ukrainian Orthodox Church). The Hail Mary is the central part of the Angelus, a devotion generally recited thrice daily by many Catholics, as well as some Anglicans and Lutherans. Anglo-Catholics also employ the Hail Mary in devotional practice. Traditional Anglo-Catholics use the prayer in much the same way as the Roman Catholics, including use of the Rosary and the recitation of the Angelus. Many Anglican churches contain statues of the Virgin Mary, and the faithful use devotional prayers including the Hail Mary. Martin Luther, the founder of Lutheranism, believed that Mary should be held in highest reverence. Although he did not agree in Mary's veneration, he did advocate the use of the first half of the Hail Mary (that is, "Hail Mary, full of grace, the Lord is with thee. Blessed art thou amongst women and blessed is the fruit of thy womb, Jesus.") as a sign of reverence for and devotion to the Virgin. The Hail Mary, or Ave Maria in Latin, has been set to music numerous times. Among the most famous settings is the version by Charles Gounod (1859), adding melody and words to Johann Sebastian Bach's first prelude from the Well-Tempered Clavier. Anton Bruckner wrote three different settings, the best known being a motet for seven voices. Antonín Dvořák's version was composed in 1877. Another setting of Ave Maria was written by Giuseppe Verdi for his 1887 opera Otello. Russian composer César Cui, who was raised Roman Catholic, set the text at least three times: as the "Ave Maria," op. 34, for 1 or 2 women's voices with piano or harmonium (1886), and as part of two of his operas: Le Flibustier (premiered 1894) and Mateo Falcone (1907). Settings also exist by Mozart, Liszt, Byrd, Elgar, Saint-Saëns, Rossini, Brahms, Stravinsky, Lauridsen, Franz Biebl, David Conte and Perosi as well as numerous versions by less well-known composers, such as J. B. Tresch, Ninel Samokhvalova, . The second of Anton Bruckner's three settings of "Ave Maria"
In Slavonic, the text was also a popular subject for setting to music by Eastern European composers. These include Rachmaninov, Stravinsky, Bortniansky, Vavilov (his version often misattributed to Caccini), Mikhail Shukh, Lyudmyla Hodzyumakha and others. This text was also very often set by composers in the Renaissance, including Josquin des Prez, Orlando di Lasso, and Giovanni Pierluigi da Palestrina. Before the Council of Trent there were actually different versions of the text, so the earlier composers in the period sometimes set versions of the text different from the ones shown above. Josquin des Prez, for example, himself set more than one version of the Ave Maria. Here is the text of his motet Ave Maria ... Virgo serena, which begins with the first six words above and continues with a poem in rhymed couplets. O Mater Dei, memento mei. Amen. The much anthologized Ave Maria 'by' Jacques Arcadelt is actually a 19th-century arrangement by Pierre-Louis Dietsch, loosely based on Arcadelt's three part madrigal Nous voyons que les hommes. Franz Schubert composed Ave Maria (Ellens Gesang III, D839, Op 52 no 6, 1825), Ellen's third song in English, as part of his Opus 25, a setting of seven songs from Walter Scott's popular epic poem "The Lady of the Lake," and was translated into German by Adam Storck; it opens with the greeting "Ave Maria" ("Hail Mary"), but is not a setting of the traditional Ave Maria prayer. It has become one of Schubert's most popular works under the title of Ave Maria. It is, however, often performed with the Ave Maria prayer sung in place of the original text; this is misidentified as "Schubert's Ave Maria." In Walt Disney's Fantasia, the tune is used in the final segment. A famous setting for the Orthodox version of the prayer in Church Slavonic (Bogoroditsye Djevo) was composed by Sergei Rachmaninoff in his All-Night Vigil. ↑ It should be noted that "Mother of God" is not an accurate translation for the Greek word Theotokos, which has very specific theological implications. "Mother of God" is the literal translation of a different Greek term, Μήτηρ Θεού (Mitir Theou). ↑ The prayer is printed in latin on the first page of the exposition and reads: "Ave Maria gratia plena Dominus tecum Benedicta tu in mulieribus et benedictus Fructus uentris tui Iesus sancta Maria mater Dei ora pro nobis peccatoribus nunc et in hora mortis Amen"
↑ In keeping with the principle of sola scriptura, Luther exclusively emphasized the quotation from Luke 1:42, without addition. 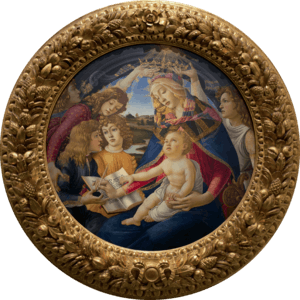 Wikimedia Commons has media related to Ave Maria.